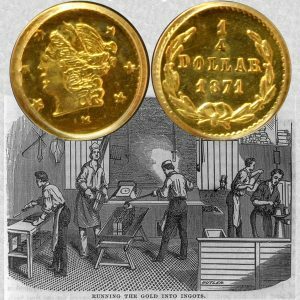 Today, the California Fractional Gold Quarter Dollar Coin remembers the many private mints and the establishment of a new branch mint on July 3, 1852. The reasons for the coinage by the private mints of California are not far to seek. It was a money of necessity, which the merchants and bankers tolerated because they were constantly expecting it would be speedily displaced by the lawful issues of the Government. But its need was felt by every class in the community. The miners welcomed it for the increased value it gave to their nuggets and dust; to meet the exorbitant prices demanded in the shops for the necessaries of life, payment had to be made in a currency easily debased by means which the recipient had no ready method of discovering, and of which the intrinsic value was always uncertain at the best; the private coins with the fair professions on their face were the only alternative, and for a time met the emergency, so long at least as confidence in the integrity of the coiners continued; the irritating and inexplicable procrastination in the establishment of a Branch Mint fostered the hope that some plan would be discovered by which the law requiring payment of Custom House duties in coins struck by duly recognized authority might be evaded. The private issues were thus actually forced upon the public by the action of the Government itself, which while acknowledging the need, failed to provide a relief, except by the expedient, after long delay, of the establishment in January, 1851, of a Government Assay Office. When the Collectors of Customs for the different ports were first appointed, Gen. Kearny, in April, 1847, instructed them to receive only “specie, Treasury notes or drafts,” in payment of duties. The only known variation from those instructions was the acceptance in that month by David W. Alexander, Collector for the Port of San Pedro, of $1,700 in Government due-bills, under the questionable authorization of Lieut. Col. Fremont, who claimed to be the Acting Governor of California. Yet with a full knowledge of the dearth of such money in the State, the constantly increasing demand caused by the rush of adventurers from the East to the gold-fields, and the importation of merchandise to supply their needs, it was not until after the authorities had repudiated the products of the United States Assay Office that Congress authorized the establishment of a Branch Mint at San Francisco. California had suffered much in her efforts to provide a stable coinage with which to conduct the ordinary every-day business of its citizens. When at last the United States Government established its Assay Office, it was hoped that like the previous expedients, it would soon be replaced by a Branch Mint, and that in the meantime its official stamp would not only guarantee to the miner a fair percentage of the precious metal for the possession of which he had borne so many privations and hardships, but would also rescue him from the clutches of the gold-dust brokers. It was regarded as a compromise, and as it seemed to guarantee the definite value of at least a portion of the bullion which circumstances compelled to serve in place of coinage, it was patronized to such a degree that very soon after it began operations the only circulating medium consisted of the octagonal slugs. From the time of its establishment, so far as can be learned, private coins were invariably refused at the Custom House, but T. Butler King, the Collector of the Port of San Francisco, was instructed by Secretary Corwin to accept the ingots bearing the stamp of the United States Assay Office in payment of duties. Thereafter, and until October, 1852, importers were enjoying the relief which these afforded from the manipulations of the brokers, which compelled them to pay a premium for the privilege of changing a coin that had been demonstrated beyond any doubt, by the United States Mint Assayers at Philadelphia, to possess an intrinsic value of $50. 10, when presented there in bulk. Occasional complaints were heard, because the Assay Office could not at once coin any but the bulky pieces, which were likened to the “Plagues of Egypt,” but the benefit was generally recognized when these were compared with the utterly untrustworthy character of a number of the private issues that had victimized every phase of California life in 1849 and 1850. It was therefore a staggering blow to the mercantile community when the ingots with the stamp of the Government Assayer were refused by Collector King, in accordance with instructions from Assistant Secretary Hodge, of the Treasury Department at Washington, and the trivial reason was given that these issues of the Assay Office did not come within the requirements of the new United States law, which required that only gold coins of the standard of fineness of the regular coinage — 900/1000—should be received. While the ingots issued by the Assay Office could not be considered as coin, they might well be regarded as fulfilling the same functions — which they did, for there is no higher function of a piece of money than its acceptance for the payment of duties at one of the United States Custom Houses — and the circumstances under which they were struck, bearing the guarantee of the officials appointed by the Government itself, put them on an entirely different footing from all the necessity pieces which had preceded them. The reason for this refusal was a mere technicality, which would have been laughable but for the serious consequences involved. This technicality lay in the fact that the coins of the Assay Office were not of the standard of fineness of the United States coinage (900/1000, as stated above), but only of the fineness of the average California gold, which ranged from 884 to 887 one-thousandths. But the same Act permitted the acceptance of foreign gold coins — those of Great Britain, France, Spain, Portugal, Brazil, Mexico and Colombia — at their intrinsic value, which was in all instances less than the value stamped upon their face. The authorities at Washington seem to have failed to see the absurdity of a decision which disparaged their own issues in favor of foreign coins. They were blind to the fact that the Assay coins were the only medium permitting a great State to conduct a business the very foundation of which lay in the maintenance of a large force of miners in the Sierra Nevadas, engaged in digging out of old Mother Earth the precious metal in such quantities that, in the course of a few years, the stupendous amount of over a billion dollars’ worth of the only real world-circulating medium was produced. The action of the Treasury officials caused intense excitement among the merchants of San Francisco, and an indignation meeting was held on October 9, at which Ex-Governor Smith denounced the order, claiming that the Act of September 30, 1850, virtually made the ingots coins of the United States; Collector King replied, showing that it was impossible for him to accept the repudiated issues, under the law, without incurring personal responsibility, but he intimated that if a satisfactory guarantee against loss should be furnished by the merchants, he would be willing to assume that responsibility. If the ingots were 900/1000 fine, he said, he believed they would be receivable. A Memorial was sent to Secretary Corwin, who apparently took no action upon it further than to call the matter to the attention of Congress in his annual report; and a bond was prepared as suggested. Representations were also made to Messrs. Curtis, Perry & Ward, of the Assay Office, which led them to strike pieces of the required fineness, and the trouble seems to have ceased, as the papers of the day make no further mention of the subject. It is probable that the required standard was adhered to until the Office ceased operations on December 14, 1853. The Act authorizing the establishment of the San Francisco Branch Mint was passed by Congress on July 3, 1852. The contract for the erection of the building was not taken within the advertised date, and on March 3, 1853, the time for receiving proposals was extended. During the following Summer arrangements were completed, and the site of the old United States Assay Office on Commercial, near Montgomery Street, having been fixed upon as the location, work was begun in the Fall. The Contract was given to a Mr. Butler, at his bid of $239,000, which was subsequently bought by Curtis, Perry & Ward, who made a new contract with the Secretary of the Treasury. The building was sixty feet square, and of three stories. It occupied twenty feet more width on the western side than its predecessor, which was forty by sixty feet. The construction was finished in the Spring of 1854, and the Branch Mint went into operation on April 3 of that year. The California Fractional Gold Quarter Dollar Coin shows with an artist’s portrayal of running gold into ingots at the San Francisco branch mint, circa 1856.